Stop throwing away your perfectly good resources!!! You loved our first post so much: 20 Things You Should Never Throw Away, so we rounded up a whole new list of things you should really think before you toss. One man’s trash is another man’s treasure. Or in this case, “one man’s trash is actually a great resource to repurpose and reuse,” but that doesn’t have the same ring to it. There are some things you have to toss but there are just some things you have to keep for future use. If you’re crafty like me, then this list is 20 more things you should keep around. This list is good for your next craft project or even something you can use around the homestead. You may not have thought about it yet but if you read along, I’m sure it will change your mind about how you look at things. Instead of throwing your banana peels into the trash bag, throw them out to your chickens. Banana peels make great chicken feed and the minerals are great for your flock! Keep silica gel packets in your gun safe. This will keep moisture out of your stored weapons, cases, and holsters. It’s also perfect for keeping gun powder dry. Collect bottle caps and get creative with it. Make a necklaces, wind chimes and other artsy stuff using old bottle caps. Use old magazines to make all sorts of DIY crafts. Involve your kids and enjoy making pots, bowls and even jewelries on a lazy weekend. Visit this site for cool craft ideas. Next time you eat an orange or a grapefruit, save the peels. Citrus peels can be used to make flavored seasonings and candies, infused in teas, and as home cleaning remedy. Check out more practical ways to use citrus peels here. Eat the lemon peel. Seriously, you can eat the lemon peel. But if you’re a bit hesitant with that idea, click here for more uses for lemon peels. We l00ove Pringles! But the growing stacks of Pringles cans? Not so much. Use recycled Pringles cans to organize pens, pencils, rulers and other desk whatnot. 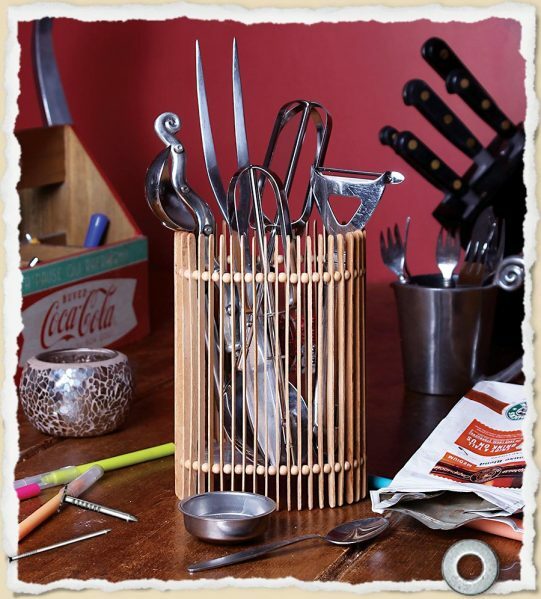 Make this amazing all-purpose container from Starbucks coffee stirrers. Click here for full instructions. Love wine? Save the corks! Here are 34 amazing craft ideas for your cork collection. Organize your scarf collection with this innovative way to recycle empty paper rolls. Paper cups are just all over the place whenever you have a party. But don’t dump them in the trash just yet. Make something pretty with them instead. Click here for paper cup craft ideas. Make these cool, crafty bracelets out of your unwanted forks. Instructions here. Make fab earrings out f your used drinking straws. Instructions here. Create this cool DIY torch made from coke can and cereal boxes. Get full instructions here. Longer ropes can be used for climbing and tying things but shorter pieces can be used to make artsy fartsy things. Don’t let your unused pile of pallets rot in your backyard. Create a beautiful coffee table made from reclaimed wood. Instructions here. Are you’re old books collecting dust in your attic? Here are 20 ideas to upcycle your old books. You can also turn old books into journals. Here’s how. 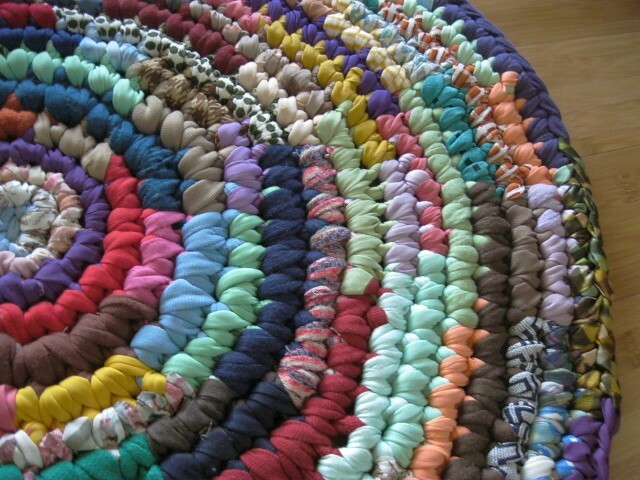 You can make your own rag rug out of fabric scraps. Details here. There’s so much to with wire hangers! Click here for craft ideas. No need to be crafty with this one. Donate your stack of outgrown clothes to needy families or to your favorite charity. Want some ideas on how you can upcycle? Here are 100 upcycling ideas from 100 Cool Ideas! Do you have anything else you keep? Share your thoughts below in the comments!